We know we shouldn’t judge a book by a cover, but you can look at the cover of a book to get a general idea of what you might find inside, and Lungs Full of Noise here is a great example. Looking at the cover as pictured above you might get the impression that the contents within will be a little bit different and highly imaginative, and perhaps a touch frightening. And you would be right! 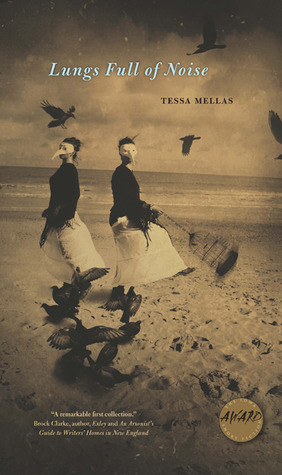 Tessa Mellas’ collection Lungs Full of Noise is everything I like in a collection of short stories. While you can’t really pigeon-hole any of these stories (some might try calling these stories speculative fiction ala Harlan Ellison or Thomas Disch) there is something unexpected at every turn. We start out with “Mariposa Girls” which seem like the perfect beginning. The realism of the story sets a mood reminiscent of Margaret Atwood or even Anne Tyler but the story … no the people in the story … slowly descend in to a state obsession and competitive fortitude that they alter their bodies, beyond repair, to give them a competitive edge. It’s eerie. It’s a bit revolting. And it’s all too possible. “Bibi From Jupiter” steps a little further into the science fiction realm, as Bibi is indeed from the planet Jupiter, now rooming in school with our narrator. But what Mellas does as a writer, a very talented writer, is give us a sideways glance at our own society through these stories. “Bibi From Jupiter” isn’t so much about Bibi from Jupiter as it is about how we react (poorly) toward something that is at first ‘different’ and then find a way to take advantage of that difference. All the stories herein take realism and skew it slightly, just enough to make us sit up and take notice. A child with flowers growing from his head; girls who over-indulge in specific fruit-eating in order to develop a color tint to their skin in order to get prop dates; the sky becomes white and residents assume it’s an anomaly, waiting for it to become blue again. The ponds in the park untidy with chickadee bodies, breasts buoyant, claws branching up without leaves. A gull bursts his larynx murdering sound. This is a sample of her lyrical prose. This is easily some of the best science fiction I’ve read in a very long time. Perhaps Mellas wouldn’t appreciate her work being labelled “science fiction” but then neither does Harlan Ellison or Kurt Vonnegut, Jr., and yet the three of them (Ellison, Vonnegut, Mellas) write some of the most powerful prose out there, which happens to have a science fiction bent to it. Looking for a good book? If you like short stories with some bite and that will take you beyond the edge of reality, then this collection is a must for you. Keep an eye out for the name, Tessa Mellas, because her work is worth watching for.